- 15.00 € x pax, plus to the part of the total of the reservation to cover possible material damages. If the damages exceed this amount will be contacted to the person in charge of the group. A bond contract will be issued. - The loss of each set of keys has the value of 10.00 €, which will be deducted from the deposit. 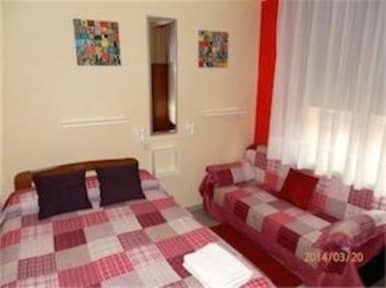 We offer rooms of several sizes and features, with TV, free WiFi, competitive rates and personal attention. Please note that VAT is always included in the rates. We are child and pet friendly. The cost for pets is 8.00 € per night. Location! Location! Location! 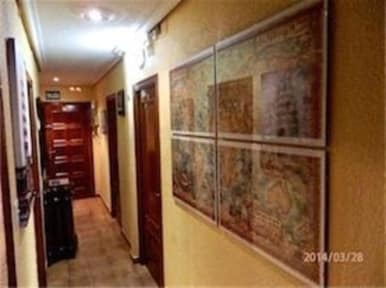 The Pension Salamanca is located right off the main square (Plaza Major) with easy access to bus and train. Individual rooms for a very reasonable price were fantastic and everything was extremely clean--from the room to the bathroom to the hallways. I would stay here again in a heartbeat! Great location, super accommodating staff and very clean! The only negative about this place was the lock to the hallway where the rooms were was extremely fidgety and was very hard to open which got annoying. Other than that I had a wonderful stay! Loved, LOVED, LOVed this place! Debra and Eduardo were great, the place was clean and safe and the location SUPREME!!! Generous and welcoming hosts, spotlessly clean rooms, and a perfect location. We enjoyed our stay! Best hostel I've stayed in so far! Both supervisors were friendly; the male highlighted monuments and restaurants he would recommend going to. I loved the private dorm. Cute rooftop terrace, great location, cleanliness was 100%, and three locks to get into your room so security was great. Lots of stairs to get into your room (which didn't bother me). The streets were noisy at night, but there was a fan in my room I turned on to get white noise. Would definitely stay here again. My room was very clean, comfortable and functionable. There is no kitchen or facilities for preparing food and no hostel atmosphere. The location is very central but overlooks a street where people tend to carouse until late at night (or early in the morning). Definitely suggest earplugs for a sound sleep. *not a hostel Pros. Nice staff location large shared bathroom free laundry. (They misplaced 2 items which I got after I chased it up) Cons. Extremely cold Uncomfortable pillow I rang the reception bell 3 Times in 30 mins before they answered. Noisy street. Just a stair case and bedrooms No proper reception/sitting area Unsanitary blankets rather then duvet/doona with washable covers I was really disappointed by the stay. It was very expensive for the quality I think. Definitely not a hostel, so you don't have activities, cooking space, common area or the hostel atmosphere, por example... The rest is fine, good location and cleanliness.